Col R Hariharan, a retired Military Intelligence specialist on South Asia, served with the Indian Peace Keeping Force in Sri Lanka as Head of Intelligence. Courtesy: Hariharan’s Intelligence Blog. The sensational title of the discussion “Is Army entering politics?” is an insinuation on army – a national institution which has earned its reputation for professionalism after shedding blood and sweat in battlefronts. A more appropriate title would be “Is politics entering Army?” There is every reason to think so, as we see a series of classified official documents containing sensational allegations relating to former Army chief General VK Singh, the army, and national security have been systematically leaked to the media since 2012. The latest controversy has been triggered by an Indian Express report on September 20, 2013 carrying shocking revelations of General VK Singh misusing the Technical Support Division (TSD) to unlawfully tap phones of ministers and to pull down the J and K government. It quoted a Secret report of an inquiry ordered by the Army chief General Bikram Singh to review the functioning of the TSD during the tenure of his predecessor. The report prepared by Director General (Military Operations) Lt General Vinod Bhatia is said to have recommended a probe by an external agency like the CBI. It was submitted to Defence Ministry in March 2013. However, the Ministry has sat on it for six months which shows either lack of seriousness of purpose or frivolousness of the allegations. After the media report raised a lot of noise, the government has promised an inquiry to bring the guilty to book. 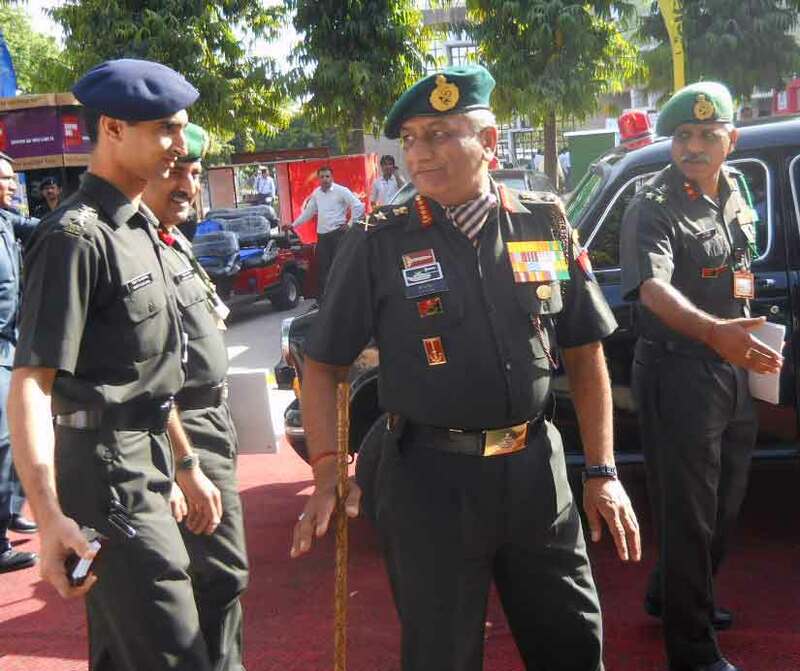 Curiously the latest Indian Express allegation against General VK Singh appeared immediately after he was seen on the stage alongside the Congress bête-noire Narendra Modi when they addressed a massive ex-servicemen’s rally at Rewari in Haryana. This was not the first time such informed leaks in the media were timed to coincide with some of General VK Singh’s revelations or acts that reflected badly on the government. For instance when his case against the Government on correcting his date of birth came up for hearing, the same newspaper made a laughable but a mischievous and alarming allegation by interpreting routine move of some military unit to Delhi as a plan of the General to carry out a coup! Though such leaks and reports were targeted against him, they have also dragged Army’s name in the mud. And the stoic silence of the Minister of Defence and the army has only fed the rumour mills. General VK Singh has not helped himself in rebutting such reports. In his TV interview on September 23 on the latest Indian Express report, he made a rather sweeping statement that the Army had paid all ministers in J and K since independence, and that everyone in the system, including the Defence Ministry was in the know. This has not only sustained the controversy but also kept it in public focus. As a person who has held the high office of the COAS people expect him to be more circumspect in his public statements. But apparently his views are different. Probably as an aggrieved party he feels he has to counter the allegations through the same media that carry them. A little more homework on his part would have helped him to project better. From the national security point of view this is a disturbing development as it undermines public confidence in armed forces at time when Jihadi terrorism is trying to stage a comeback in J and K. It is a mystery why the Government of India does not appear to have made serious efforts to either plug the leakages or bring the culprits to book. In the case in point, the government took no action for six months after the report was submitted; this gives rise to suspicions of official patronage for the whole exercise at some senior level. The credibility of the government can only be restored by carrying out an impartial enquiry into the whole affair and the guilty are brought to book. However, credibility in such inquiries has been eroded as controversies have been dogging national investigative agencies. In view of this, the enquiry should be conducted under the supervision of the Supreme Court and expeditious action taken on its recommendations. Over the years partisan politics has eroded effectiveness of administration. Police forces have been rendered ineffective and national institutions like the Intelligence Bureau, Central Bureau of Investigation which are the pillars of good governance and security have been systematically degraded. Now the armed forces, the symbol of national integration and unimpeachable integrity, appear to be facing the same fate. This has saddened over two million veterans; it is likely to adversely impact the minds of soldiers defending our troubled borders. 1. It indeed is a very sorry state for our Nation that in order to counter the popularity of someone whom nation seems to have already accepted as our next PM, the ruling party has not hesitated even once before tarnishing the image of someone who not only went on to became the commanding officer of a million plus strong armed forces rather is one of his kind to be honoured with the “Hall of Fame” in United States. 2. The article begins by a sarcastic turn quoting the title as ” Politics entering Army” which to a large extent I feel is totally correct. Whereas in developed countries like US , Russia or UK, the experience of Veterans is being made use of by giving appointments like Defense Minister or even President, why is it so in our nation that it is viewed as a taboo? 3. In my opinion the debate what the article was titled should have been continued and a discussion on the same would have yielded certain valid points. Indian “Phaujiwalas” prove the above addage, with their feudal , corrupt and rowdy antics. Pt. Nehru knew what would happen even then. So he removed the Scotch sipping, British talking( talking only; the actual mindset which is patently medieval/feudal) , Superiorty Complex drunk Generals from policy and threw them back to their barracks on the borders, where they belong. It turns out , with the recent “scuffle” in the present Army Chief’s unit (ironic??) , that Nehru was right in his decision to downgrade the military- which is more like a militia.